Resolve the "when scored" ability on an agenda in your score area. 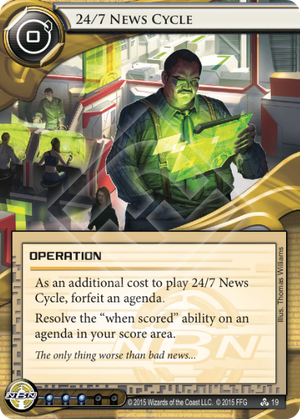 Current gameplay focuses on its role in kill combos, but 24/7 News Cycle has the potential to be a Swiss army knife type of card, like a Same Old Thing for agendas. With the right agenda mix, it becomes a multi-function tool in the mid-to-late-game that can break a siphon lock, tutor a crucial card, amputate the opponent's board position, or set up a fast-advance play. If you have room to slot them, Domestic Sleepers, Project Kusanagi, and Clones are Not People make it cheaper to play. It obviously finds a better home in decks that slot numerous 1-point agendas, such as some current Jinteki PE, Argus Security, and NBN CMT styles. Resolve License Acquisition to install Corporate Town or Ibrahim Salem (or perhaps an urgently needed Jackson Howard) from archives and rez without cost. This amazing card helps NBN kill decks work around Film Critic. More generally, it facilitates runner kills without the need for the runner to trigger anything. Even the most cautious of runners could be killed! Score out Breaking News plus another agenda. Next turn, activate 24/7 News Cycle to give the runner two tags, before double Scorched Earthing (or Traffic Accident Scorched Earthing) them. Ta-da! This is the immediately obvious use of the card, and indeed it is being used in this way in a new breed of Haarpsichord Studios: Entertainment Unleashed decks.